Issue #109 January 2017 – Happy New Year! E-Newsletter : Issue #109 January 2017 – Happy New Year! Greetings! I hope that your new year is starting off well. This month I am pleased to be featuring new works by several of my favorite artists. You may view more outstanding works by all of these artists by clicking on the links below. 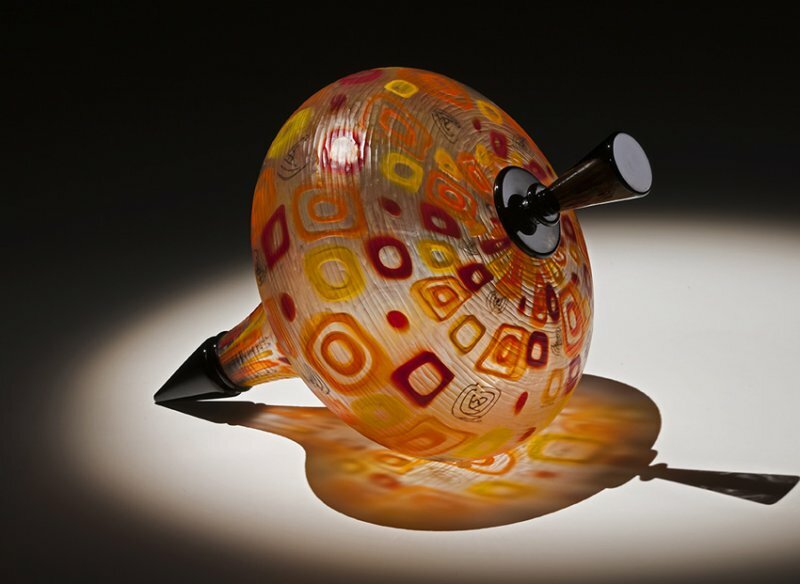 You might also want to go to my Gallery Artists page to see the work of 40 or so other glass artists that I represent. Thanks for taking a few moments to enjoy this newsletter and happy New Year to you and your families! The "Mandara" series is one of Lino’s most complex series, with its multiple layers and patterns of color. I chose this particular piece at Lino’s Seattle Studio in November for this reason and also for the exquisite cane work and the striking color combination of blue and vivid yellow. Austrailian Landscape by Marvin Lipofsky, 11" x 16" x 12"
Many of you know that in 2016 we lost one of the great pioneers of the studio glass movement, Marvin Lipofsky. Fortunately we still have some wonderful works of Marvin’s available and this piece from the Australian Landscape series is one of my favorites. I love the organic sculptural form and the exquisite combination of colors. 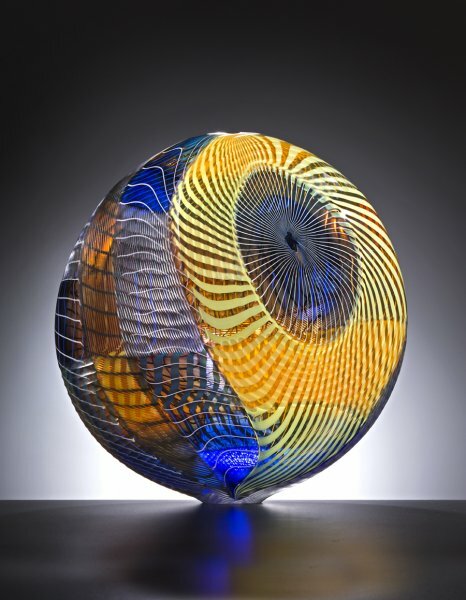 Harry Pollitt is one of the few contemporary American glass artists who carves his sculptures from wax and casts them using the ancient lost wax casting technique. 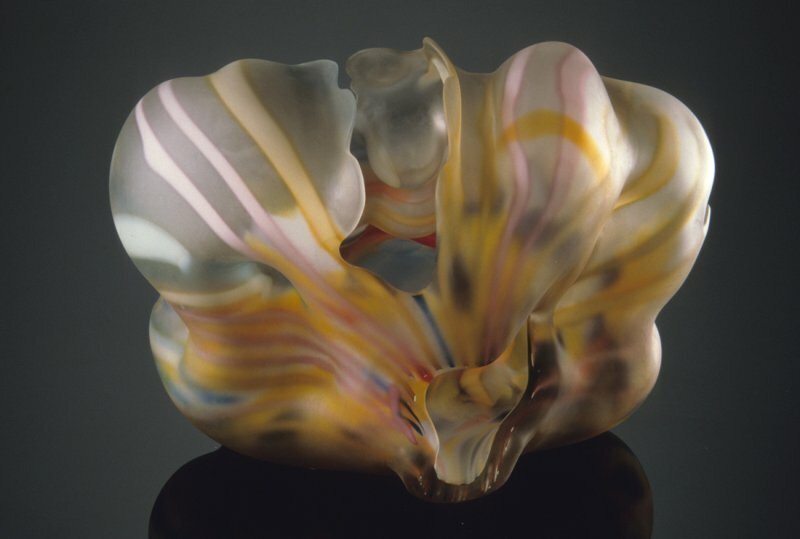 The beautiful color, the flowing form and the use of negative space make this a truly unique sculpture. I just received two beautiful new pieces from Nancy Callan and was unable to decide which to feature here so I am featuring both! The wonderful murini in this piece, the multiple shades of orange and the surface carving make this an outstanding example of Nancy’s signature "Top" series. The black at the top and bottom of this piece provides a dramatic contrast to the colors in the body of the work. Wow, what a dynamic piece! I love the swirly murini and the unique combination of colors. 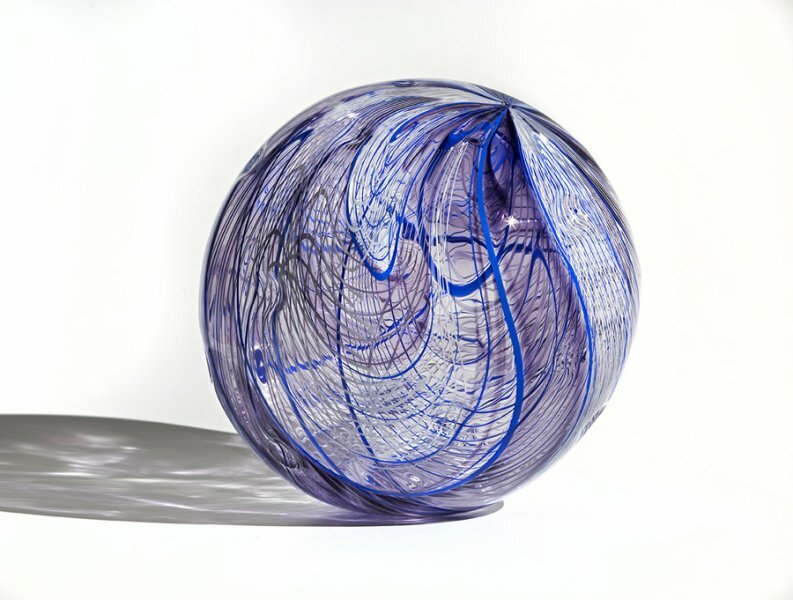 Purple Haze Orb by Nancy Callan, 16.5" x 16.5" x 16.5"
I hope you have enjoyed this month’s edition of Holsten Galleries News. As always I welcome your comments and questions.